Come morning, we are off on our road trip! 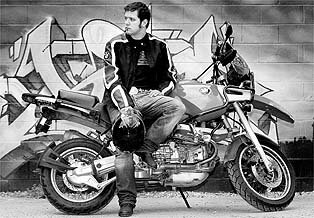 Okay we are not going by motorcycle and we are not George Stroumboulopoulos. The fact is we will be taking the Urban Assault Vehicle, because of course we will need room for Jerry's little fishing boat and all of our books and games and movies. We've even packed the tape containing the final episode of The Hour, as we still haven't had a chance to watch it, and it will be perfect for winding down after a day packed with fishing and scarfing back trans-fat laden snacks and winging badminton birdies at each other's heads and slurping back red wine and trying to decapitate each other at Crokinole. "na na na na naa, I made you eat your parents!" It fits in perfectly with the Kaiser Chiefs song! I'm serious; try it! "What just happened to us? I think I fell asleep at the wheel. We must have fucked up the car real good because I can't feel anything at all". Those lyrics are a trifle disturbing for a car trip, I'll admit, but on the other hand, a little cautionary tale never did anybody any harm. Have you visited Ben's new music site yet? You have to go there! It is pretty amazing. Now Ben's old site was always full of excellent information and many of us music nerds always headed over there for our information. But his new site! It's a trip all by itself. Well done, Ben. Your loyal fans are proud of you! Oh yeah, Allison - I completely forgot about that part where I don't have to go to work on Monday morning! Thanks for the reminder! Kaiser Chiefs are a happy sounding band. I'm sure we will drive fast while they are singing. thanks for the link. You are very kind. I've still got about 200 reviews to upload, but it's starting to take shape. Kaiser Chiefs are a great Pop band and I'm looking forward to hearing their new stuff once Ricky Kaiser has recovered from being run over by a car not so long ago. What? I didn't hear about that incident, Ben, but then I have been putting away all of our music magazines UNREAD for the last month so that we can read them on this trip. I hope Ricky will be okay. I'm enjoying your new site a lot, Ben - it's pretty awesome. Wow ... awesome mix. I certainly have to make a few of those whenever hitting the road. I am enjoying Ben's new site as well. Thanks Will. I arrived home to find a couple of GREAT looking mixes waiting for me - thanks so much! I've only had time to listen to one song - Feeling Oblivion - and it is so lovely! What a great homecoming - thanks again, sweetie. wow. You're the coolest family evah, baby! I hope you had a blast and made more wonderful memories. See you when you get back!